Avi Controllers continually exchange information securely with Avi Service Engines (SEs). 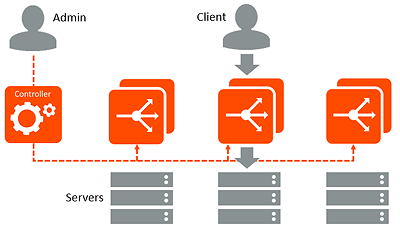 Likewise, in cluster deployments (multiple Avi Controllers), the Avi Controllers also continually exchange information with one other, securely. SEs perform data plane operations such as load balancing, and report related information to the Avi Controllers. This information includes server health, client connection information, and request logs. In cluster deployments, the multiple Controllers share the workload for log processing and analytics. Avi Controllers also may sometimes send commands down to the SEs, for example to make configuration changes. During normal operation, this management traffic may average a few Kb/s per SE. Spikes in communication may occur if the Controller requests full client logs, which may potentially be several GB in size. Avi Controllers and SEs communicate using SSH port 22 over their management IP addresses. When a new SE is deployed and is connected to the network, it contacts the Avi Controller to set up a secure management session. (The management IP addresses of the SE and Avi Controller are included in the SE’s meta-information.) The SE and Avi Controller exchange keys and establish an encrypted connection over port 22. Once the connection is fully established, the Avi Controller pushes down the relevant configuration to the SE. Avi Controllers never initiate these connections. They are always initiated by the SEs. Generate a self-signed root CA for the controller cluster. This will act as the trust anchor for the Avi Controller and SEs. Each Avi Controller node in the cluster will be identified by a unique key pair that is signed by the root CA. 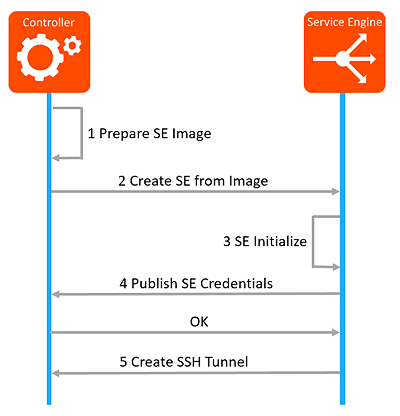 Generate a SE Image key pair to enable automation of the creation of SEs upon demand. Controller packages the root CA certificate as well as the SE Image key pair in the SE image. Upon bootup, SE will generate a unique key pair for itself to create the SSH tunnel. An internal aviseuser identity is used to create the SSH tunnel. Establishes an HTTPS session to the controller on port 8443. Verifies that the Avi Controller presents a certificate that is signed by the root CA certificate. Uses a REST API to publish the SE specific public key to the Controller. API data contents are signed by the SE Image credentials which is verified by the Avi Controller. This step happens only once. Avi Controller saves the SE specific public key in the authorized keys for aviseuser from this SE. From this point onward, SE can establish the SSH tunnel using the SE specific credentials. SE Image key will no longer be permitted for API requests on 8443 from this SE. A secure channel is a SSH forward, and SSH reverse tunnel used for communicating between Avi Controllers in a cluster, and between Avi Controllers and Avi SEs. Using aviseuser and the SE specific key pair, SSH tunnel using port forwarding is created over which SE talks to the Avi Controller. In the example mentioned above , the Avi Controller’s 127.1.0.1:5097 is mapped to localhost:22 on the SE.